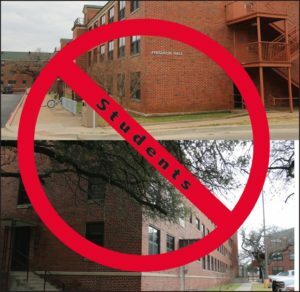 Tarleton State University’s oldest residential facilities, Bender and Ferguson halls, will no longer be used for housing starting next fall semester. Bender, the all-male facility built in 1953, and Ferguson, the all-female dorm built in 1958, typically provided housing for freshman students with two residents per room and community bathrooms. That changed in 2016 when the university made the decision to have both Bender and Ferguson house returning students in single bedrooms. In September 2017, the university relocated 80 students from Bender into other available spaces on campus as a preventative measure after mold was found in the facility’s air vents. Although these resident halls have been used to house students for many school years including during the summers, this spring will be the final semester they will house students. Kunze said the change would start this upcoming fall. “As to whether they were to be torn down or not, I was not aware of any official plans in the near future for them to be going away. But I do know that in the 2020 Master Planning documents, they were no longer present,” he said. Bender and Ferguson provided the most affordable housing option for returning students with costs just over $2,500 per semester. Without these facilities next semester, affordable options may become more limited. Students needing information about assignments or reassignments can contact the office of Facilities and Special Events at 254-968-9083 or by email at Housing@Tarleton.edu.